Please join us in congratulating the winners. Dene Grigar and I would also like to invite all residents of Clark County to visit the businesses listed below to show their support for poetry. I am very grateful to the businesses listed for their participation in the program. for a list of the shops and the full text of the poems. We will update both sites as we add locations to the list. Many thanks to Dene Grigar, Associate Professor and Director of the Creative Media & Digital Culture Program at Washington State University Vancouver, for organizing and managing the Poetry in the Shops Program. She was also instrumental in securing the Spark Grant from Humanities Washington that made the contest possible. 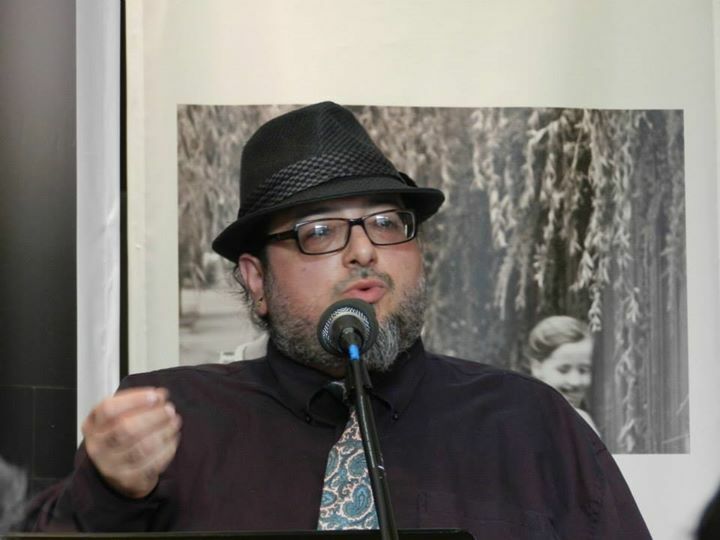 Clark County Poet Laureate Christopher Luna recently received a Spark Grant from Humanities Washington which allowed him to fund various activities including open mic poetry readings, workshops, and lectures. It also helped him to launch a poets in the schools program in Clark County, an ambition of Luna’s that predates the poet laureate position by several years. debut collection by Vancouver poet Jenney Pauer. His books include Brutal Glints of Moonlight, GHOST TOWN, USA and The Flame Is Ours: The Letters of Stan Brakhage and Michael McClure 1961-1978, an important piece of film and literary history that Luna edited at Brakhage’s request, available on Michael Rothenberg’s Big Bridge.org. Recent publications include Bombay Gin, The Understanding Between Foxes and Light, Unshod Quills, Chiron Review, and Soundings Review. The frost settles upon the ground. Snows settles upon the limbs of trees. The ceiling in my house settles; creates small cracks. The floor creeks and settles the weight of dogs approaching. We settle, let the weight of the world crack our ambitions. We let others harsh words and criticisms drape us like settled winter fog. there are still secrets to be kept. as I dip my feet into the icy river. and the only travelers were ducks and geese. made of twigs and fishing twine. of the river mingle with my own. its torn sail flapping in the breeze. On the light, warm breeze. Still frame nerves of the city. they just keep on working. Nerve still frames of the city. Dark blocks of shadowed high rise. It just keeps on soaring. 1 To start with, take your shoes off. How do you expect to make poems with clothed toes? 4 Sear with cosmic gasses. 5 Test for doneness with left heel. don’t give in too easily. not simply a surface to tread upon. and not just pliable friendly soil. your wisdom, dreams and aspirations. sticks thick in my nose. what does she find to talk about, on and on? Tears may hurt, or not, but they always dry up.